In the case of progress in the implementation of reforms, Ukraine will receive 1.8bn dollars. Japan will provide 13.6m dollars in humanitarian assistance for the reconstruction of Donbas, President Petro Poroshenko has said. "We are grateful to the Japanese side for today's decision to provide a new tranche of humanitarian aid worth 13.6m dollars for the restoration of Ukraine's eastern regions," the Ukrainian president said in a press statement after the meeting with Japanese Prime Minister Shinzo Abe. Earlier this year, Japan announced plans to provide Ukraine with 3.5m euros for the construction of a nuclear fuel storage. "This year marks the 30th anniversary of the Chornobyl accident ... This year, we decided to allocate 3.5m euros to the construction of a nuclear fuel storage in Ukraine," Abe said. He also said that Japan, together with other G7 countries, will support Ukraine in this sector. In addition, according to Abe, Japan will give Ukraine 1.8bn dollars on condition Ukraine reaches progress in implementing reforms. "For my part, I have such an intention: in the framework of the implementation of reforms in Ukraine, we will fulfill our promise of providing assistance to Ukraine in the amount of 1,850m dollars for reforms," said Abe. 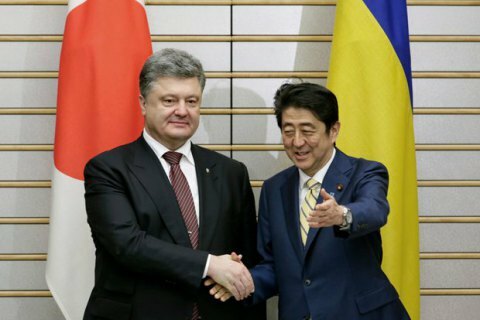 On 24 March, Japan allocated 331m dollars to Ukraine. Concessional loans were provided under a joint project with the World Bank "Second Programmatic Financial Sector Development Policy Loan". The money will be spent on strengthening macroeconomic stability and economic reforms. Means are provided for 20 years with a six-year grace period. Japan will provide 13.6m dollars in humanitarian assistance for the reconstruction of Donbas, Ukraine's President Petro Poroshenko has said.